When human observers look at an image, attentive mechanisms drive their gazes towards salient regions. Emulating such ability has been studied for more than 80 years by neuroscientists and by computer vision researchers, while only recently, thanks to the large spread of deep learning, saliency prediction models have achieved a considerable improvement. Data-driven saliency has recently gained a lot of attention thanks to the use of Convolutional Neural Networks for predicting gaze fixations. 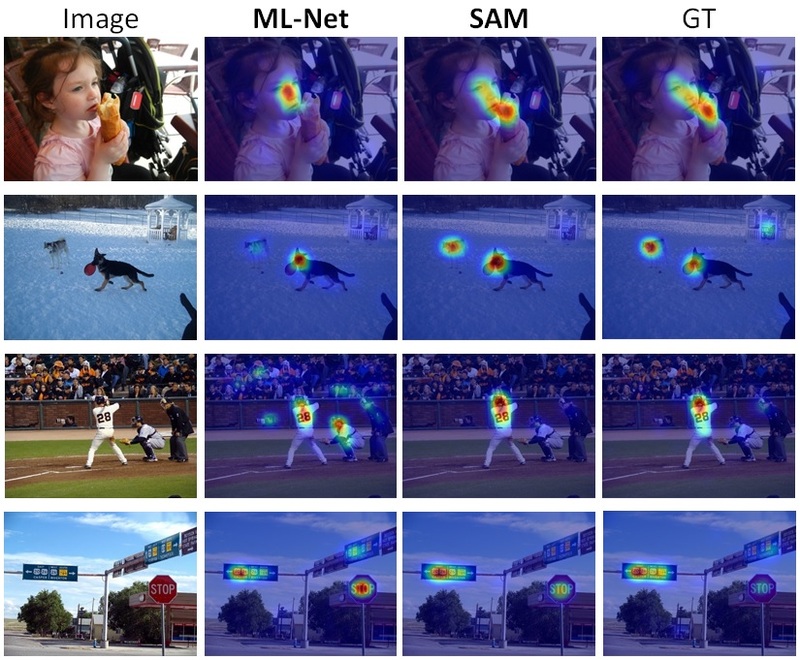 In this project we go beyond standard approaches to saliency prediction, in which gaze maps are computed with a feed-forward network, and we present a novel model which can predict accurate saliency maps by incorporating neural attentive mechanisms. The core of our solution is a Convolutional LSTM that focuses on the most salient regions of the input image to iteratively refine the predicted saliency map. Additionally, to tackle the center bias present in human eye fixations, our model can learn a set of prior maps generated with Gaussian functions. We show, through an extensive evaluation, that the proposed architecture overcomes the current state of the art on two public saliency prediction datasets. We further study the contribution of each key components to demonstrate their robustness on different scenarios. The latest saliency prediction model developed by us has ranked first in the LSUN 2017 Saliency Challenge, which took place at CVPR, Honolulu, Hawaii. Our model integrates an LSTM-based attentive mechanism to iteratively attend and refine predictions at different locations. A variation of that model has been accepted for publication to IEEE Transactions on Image Processing. You can download the paper here.